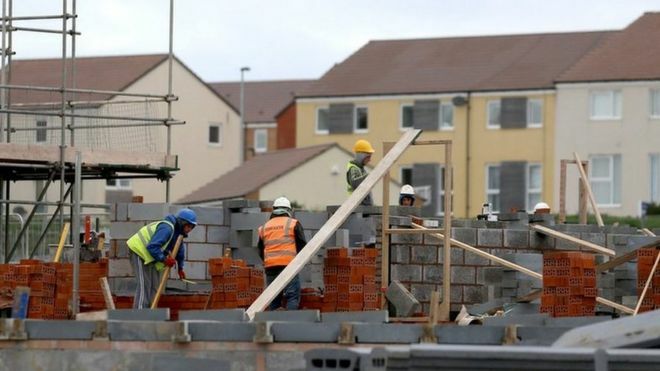 The shortfall of new affordable homes in England will soon be equivalent to a city the size of Leeds, a charity is warning. The Joseph Rowntree Foundation says the supply has fallen short of demand by 30,000 every year since 2011. This cumulative shortfall could reach 335,000 by the end of this parliament, trapping families in insecure housing as a result, the charity said. The government said it was investing £9bn in the sector. Married parents of three Dawn and Adrian, from Milton Keynes, told BBC Radio 5 live Investigates their family's health had suffered since being forced into temporary accommodation while they wait for suitable social housing to become available. "Both of us have had issues with mental health and ability to cope," said Dawn, who asked that their surnames not be published. "It's all come to a head, the culmination of that means Adrian's pretty much had a breakdown for the last couple of months and been signed off work," she said. Adrian, who like Dawn works full-time, said not being able to afford a home meant that "being a proud man, at the end of the day, I took a lot of stick to myself. I beat myself up inside. "Because when you've got a wife and three children, I felt a failure," he said. The government is due to release a green paper on social housing this spring and independent assessments suggest around 78,000 new affordable homes are required in England each year between 2011 and 2031, to meet demand. The Joseph Rowntree Foundation's acting head of policy and research, Brian Robson, said their analysis shows there have been only 47,000 additional affordable homes in England each year over that time. "If delivery continues at the current rates by the end of this parliament, by 2022 that would have reached 335,000 homes. "That's equivalent to a city the size of Leeds," Mr Robson said. The analysis is part of a briefing document the charity will present to the government on Monday for inclusion in its social housing green paper. The Secretary of State for Housing, Communities and Local Government, Sajid Javid, and Housing Minister Dominic Raab were unavailable for interview. In a statement, the ministry said: "We are delivering the homes our country needs and since 2010 we have built over 357,000 new affordable properties. "But we are determined to do more and we are investing a further £9bn, including £2bn to help councils and housing associations build affordable homes where they are most needed."